I've started wearing the hijab again. This time around, I'm trying my best to cover up arms fully, meaning no 3-quarter sleeve. And am also slowly progressively trying to cover my chest (breast) area - unless if i'm wearing something loose. Since this is my second attempt, I already know the styles of hijab that I like and the way to wear them - very simple-lah! The only problem I have is the lack of long sleeve casual shirts and comfy long pants. Hmm...I'm seeing some holes in the pocket developing soon! I remember when I first wanted to start wearing the hijab about a year ago, I was conscious on what people would think of me. I decided on 2 days notice that I was going to TRY to wear the hijab and surprisingly lasted for about 6 months or so. However, my surrounding wasn't right at that moment..CORRECTION.. I was the one who was not at the right state of mind at that moment. I knew that I wanted to wear the hijab but I wasn't mentally strong and prepared...and I gave up easily. I once related to a friend on me taking off the hijab and he said, "You know that when you're trying to be better, syaitan will try to beat you stronger, with all sort of challenges.." and at that moment I knew that I failed facing those challenges. I gave in. Oh well. Past is the past. 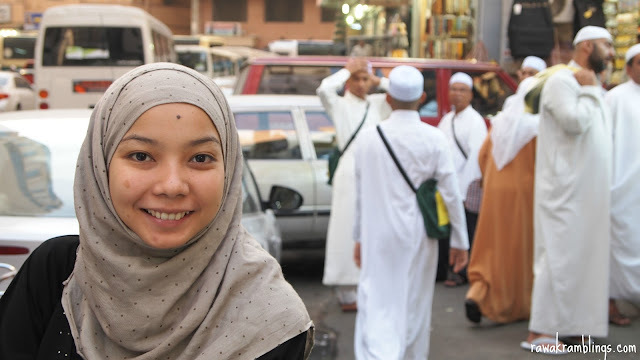 This time around, I am more calm with the hijab, I feel at peace. Alhamdulillah. Mr has also been such a supportive partner, always telling me that I look pretty in hijab. Sometimes, that is all that matters, that when your husband says that you look good, you couldn't be bothered with what everyone else say. "Aik? You're wearing the hijab again?" "I don't get it.. one time you were not wearing it, and then you wore your scarf, you open it back..and then you're back on?" "Are you wearing this because you're married? Did your husband force you to?" "Are you wearing this because you just came back from Umrah?" And ALL these questions came from the non-muslims..many were curious. As for the Muslims, most of them just smiled and some said "Alhamdulillah.."...only God knows what's in their head! I really hope they mean good! Hihi. "Yes... my second attempt.. I'm gonna try this again..", and then they wish me luck. Honestly, this is not my second attempt. This is no more an attempt but for real. May Allah ease this and give me strength to overcome whatever challenges that the syaitan may give me in putting on the hijab. 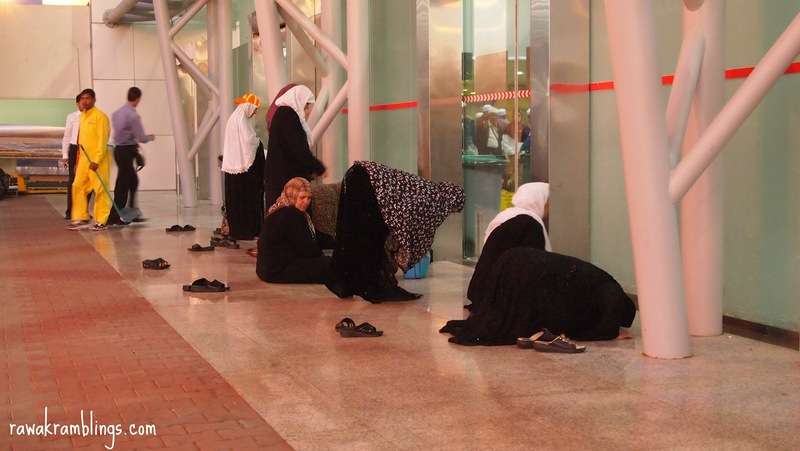 Wearing the hijab (covering the aurat), just like salah (solat) is not an option..it is an obligation. Jews, Christians, Muslims... despite the differences in believing certain 'book' or certain prophet, we all pray to the same God. Yusuf Estes, who used to be a strong active American Christian preacher, believed in God and that Jesus is the son of God. He prayed, EVERY single day, that God brings him closer to Jesus and to God..This one time, he was on a strong mission to convert a Muslim to Christian, but he found Islam instead. He is now known as Sheikh Yusuf Estes, a popular dakwah speaker - you can find him all over the internet. What I'm trying to point out here is, we seek for guidance (hidayah) and Allah chooses who He wants to give his guidance (hidayah) to. A muslim who doesn't pray and doesn't ask for guidance (hidayah) from God is pretty much at the same level with the non-muslims who pray to God (the same God) and seek for Hidayah. With God's will, the non-muslim's prayers will be answered, and he embraces Islam, being like that white piece of cloth- new-born innocent Muslim with all his/her pasts erased. While the non-practicing Muslim will still be a Muslim-by-name, with a black cloth now, and his fate in the hereafter (akhirat) still unsure. We shouldn't look down at non-Muslims, thinking and confident that we'll get a higher place in the akhirat just because we're Muslims. At any single second, Allah can bring them higher than where we are. We are all at the same level, seeking for the truth, seeking for the Hidayah. Always always remember to pray and ask Allah for Hidayah - only Hidayah can bring us to the right straight path. May this video of Yusuf Estes inspire us. He told the Christian, if you truly want to understand Islam, don't bother reading articles/watching videos on the internet. Just learn arabic and read the Quran. We all wanna be a better person, everyday. But it's never easy. Change is never easy. It always comes with challenges to test our strength. There will always be that old environment,that old habit, that needs to be chucked out before you can start building new environments and new habits. I think we both, me and Mr, are trying our very best to be better and instill new habits. We've been trying to reach to the office sharp at 8.30am but only manage to achieve that just once last week. Today, we decided to fast and so we woke up for Sahur but then we failed miserably waking up again and reached the office at 9.30am. Oh my. Once, Mr. tried waking up for Tahajjud and he missed his Fajr prayers instead - adoyai. We've been trying to make sure that we pray 5 times a day and alhamdulillah, well achieved, until the weekend - we missed two Salahs - due to what else other than sleeping - masyaAllah. Our room is untidy - and its just a room! I don't know how I'm gonna manage tidying a house. Folded clothes are not being put in the cupboard right away, but left in the laundry box. We're both trying to be better children to both, our parents, and parents-in-law, and its been ok so far, without denying the minor hiccups here and there. I guess that both sides are adapting to this too - when to let go, when to advice, when to get involved, where is the line ,what to expect. I think we are slowly adapting to this new life and also sharing our lives - the responsibilities and the routines. Oh. In achieving that balance. May Allah ease our journey. "Lets both try our very best to be the best muslim and muslimah, so that when any one of us leave the world first, we will be sad because of the longing feeling for each other and because we will miss each other very much BUT we will be happy and calm because we know, insyaAllah, we will see each other again in Jannah..and by then, it will be for eternity.."
If you love your family and you want to be with them till eternity, love Allah, and remind them to love Allah too. Prophet Muhammad (PBUH) once said (predicted)..
And the minute I saw it, I just stood there. As I read my prayers quietly in my heart while looking at it, I cried…and cried..I’m not too sure if it’s the feeling of surreal-ness of if it’s the prayers that I said in my heart, which something that I deeply desire from Allah - but I cried uncontrollably. I looked at my husband next to me, who said his prayers aloud, and then we both said “Amin…” and smiled each other. Syukur Alhamdulillah..I’m finally here at your house O Allah. I was also told that honest prayers (du’a) carried out at Hijr Ismail will also be answered, insyaAllah. 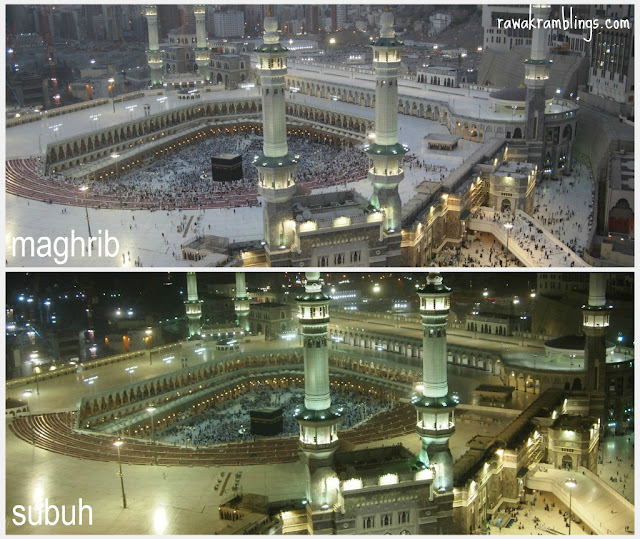 Hijr Ismail is a small horse-shoe shaped area – cramped with people praying. I carried out a solat hajat, asking Allah to please please please give me a chance to pray there. I walked towards Hijr Ismail, all the while praising Allah through Zikr, and then with confidence I walked towards it, and all the way, the journey was smooth, Alhamdulillah! Somehow, the crowd magically let me pass through and I even managed to conduct 2 rakaat sunnah prayer without any obstruction of people kicking me or pushing me..masyaAllah. At that moment, I cried..cried even harder.. because at that moment, I felt something that I’ve heard many times before and THOUGHT that I understood it. At that particular moment, I felt FAITH. As a Muslim, we are taught that Faith is believing the existence of Allah and that the last Messenger of Allah is Nabi Muhammad (PBUH) – which is our kalimah syahadah. Yes I’ve always believed that and never doubt it.. but what I felt at that particular moment, was just unexplainable – it was a feeling of satisfaction – of contentment- of greatness! – masyaAllah. I just couldn’t stop crying, I was crying like a baby! Alhamdulillah – thank you Allah for letting me find YOU there. Lets try putting this in words – FAITH – is believing and feeling the existence of Allah, and then we conduct our daily action or we pray with confidence that HE will assist us here in this world and that HE will reward (or punish) us for the options we make here. With confidence of Allah, the world will crawl under us, trust me it will. BUT you need to have the confidence, the faith…and the approval (redha) that if it doesn’t happen, there will always be a GOOD reason why – you may see it here in this world or in the hereafter. Have faith, and you will be satisfied and happy, insyaAllah. I may have travelled all over the world but in Makkah, I found something that I’ve been looking for.. and I pray that this feeling will stay on.. and that the Kaabah will always be in my heart..to remind of of that precious moment. Me and Mr. upon arrival at Jeddah Hajj airport. 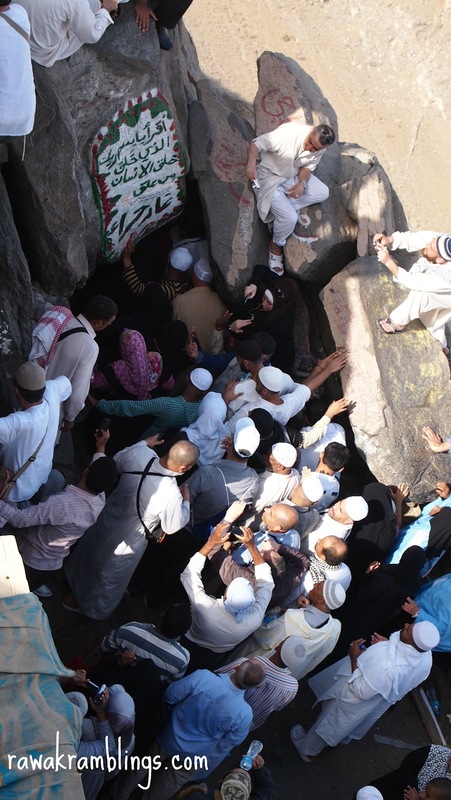 The crowd pushing in to enter Gua Hira' at Jabar Nur. 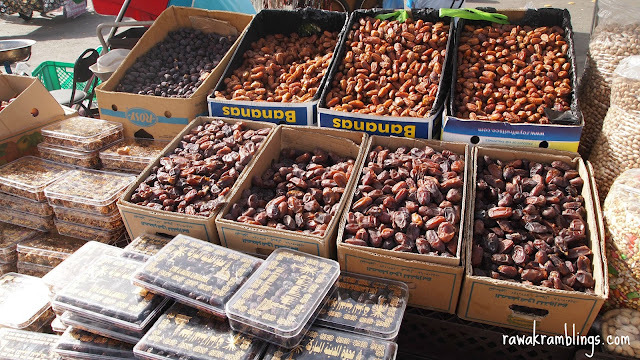 The different types of Kurma sold at the markets. Mr. met his long lost brother.